We have been putting up produce from my daughter’s garden, as well as other produce that comes our way. It is part of the “waste not, want not” mentality that I was raised with. 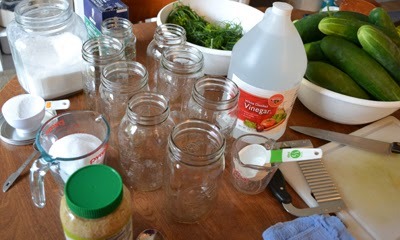 Be it pickles or fruit or herbs or even material scraps of one sort or another, we squirrel it away. I learned a long time ago that if ever I need to feel better, there is nothing like giving a little something to another to lift my own spirits, as well as those that I give to. With collections of home-canned produce, or tiny homemade gifts, or even sending a "like-new treasured item that another might enjoy" doesn't cost much and it makes me happy! Of course, it need not be material possessions. Gifts of self may be given too. Kind words, a phone call to those that don’t get out, an e-mail or card to let another know that they are being thought about or surprising your mate, child, or friend, by fixing them a hot cup of tea, or cocoa or even a glass of ice water is but a tiny gesture that can let them know how much we love them. It is easy to forget that doing such small acts of kindness can touch the heart of another. "It's the simple things in life that bring me the most happiness. I am full of gratitude for all I have. Here's 2 chords of wood delivered today... I love fire wood and I love stacking it. It's helping me to face the change of seasons here in New England smoothly and with positive anticipation. I can't wait to get at it! This little turtle pincushion was made by Jane McMillen of Little House Home Arts. I'm a slowsky....my husband is the hare! That's what keeps things functioning around here. The turtle is one of my favorites of Jane's pieces. When he's not on the woodpile he's among the others I collect. My husband spotted it right away in the gallery at Bedlam and bought him for me. Now, Jane couldn't be there Sun. and I was disappointed. She and I became friends a la the Jon Katz method, through the internet. We made a deal to become"penpals"(remember when we were kids and had pen pals?) last fall. She's an exceptional woman, artisan, and hot sh-t! Also a retired psychiatric nurse she helped me through a difficult period of time going through a heart procedure. No one warned me about the depression to follow for all kinds of reasons. She supported me and traveled through this difficult time right by my side. (Even though we are states apart.) She kept me hopeful and laughing all winter. For this I'll be forever grateful. We traveled to Castleton, VT one w/e to visit her home and pick up "Atilla the Hen", my grumpy doorstop. The four of us had a grand time! 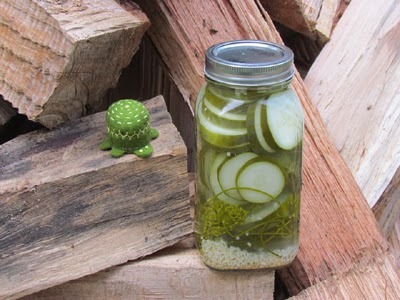 So when her hubby came to pick up her wares at the end of the open house he brought us this jar of garlic pickles Jane and her daughter had put up. This meant so much to me. We both think it's pure artwork and too pretty to open and enjoy. I think we'll admire it a bit longer! Yes, these simple things have made me a happy woman today. When we say grace before we eat each night we always ask to stay grateful. It's working so far!" C.C.